This website is better viewed at 1024 x 768 resolution. 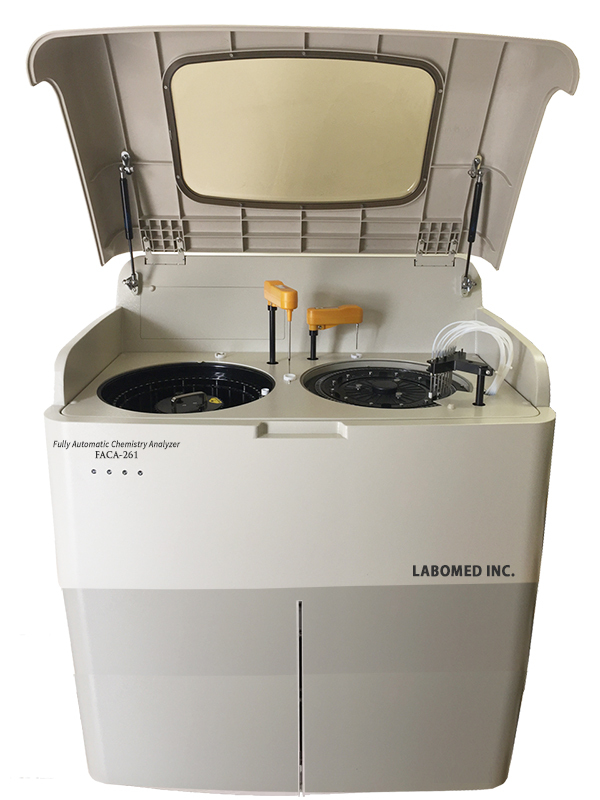 Labomed introduces an automatic biochemistry analyzer with varying testing capacities. Labomed, Inc. is certified by ISO 9001-2013, has CE Conformity and is FDA Licensed. Each set of FACA will come with one video to train in the installation, operation, and maintenance of the biochemistry analyzer. 80 Cuvette positions, semi disposable plastic for min 30,000 tests/80 Cuvettes. External sample barcode reader, with positive identification of samples. Primary tubes up to 16 x 100 mm and sample cups. Preinstalled & validity limits for methods and reactions programmable. Intelligent flagging system and extensive error log. Reagent integrity check & extensive QC monitor. Complete reaction curve & statistics for every sample/test-not only QC. ISE Module available upon request. Fully Automated, Bench Top/Floor Top, Discrete, Random-Access with STAT functionality open system Clinical Chemistry Analyzer. At least 60 sample positions for Primary tubes & Sample cups and option for additional (20+20) =40 positions for Primary tubes & Sample cups. Automatic Pre-dilution & Post-dilution of samples. Max 30 different parameters can be performed simultaneously. Min 40 positions with on board refrigeration at 9 °C below ambient temp with independent switch for 24 hours reagent cooling even if the machine fails to run. 8 positions filter wheel with 7 pre-installed supplied filters & 01 free position. Reaction wells positions: 80 Cuvette positions, semi disposable [> 30,000 tests]. Incubation temperature & Time: 37°C ± 0.2°C & 792 sec. max. incubation including reading time. Two types of Systemic (20L) & special washing solution (2L) and 20L waste with level sensor. 2nd cleaning solution & extra washing definable in method. Liquid transportation through pipetting arm with capacitive liquid level sensors. Needle shock detector & vertical collusion detection for probe. Measuring modes: Routine chemistry, Turbidimetry. Analysis modes: End Point (bichromatic) & Differential end point with self blank, Fixed Time & Kinetic (Bichromatic). Calculation modes: Factor, Multi Standard, Single Standard. Calculation algorithms: Linear (factor, linear, linear regression, average) & Non linear (cubic spline, poly-linear, logit-log). Programmable Test: 50 active Programmable Test methods on instrument with unlimited programmable profiles. Standard Calibration Method: Up to 8 calibrator standards per test. Memory: For Sample results, calibration, patient data, QC data, error-log, absorbance curves. Reports: For Patient, single test, complete sample, work sheet, method and QC´s, calibration curves, kinetics, continuous printing. QC Module: Levey-Jennings plots, Westgard multirules, SD, CV% & Mean. Warnings: Analytical limits, reagent and reaction integrity check (blank, linearity, substrate depletion, reaction OD etc) with extensive QC monitor. New versatile touch screen user software with intuitive smart graphical user interface. Extended walk-away capability with free choice of execution order. ASTM Bi-directional LIS, Ethernet of external PC, polling mode on LAN. 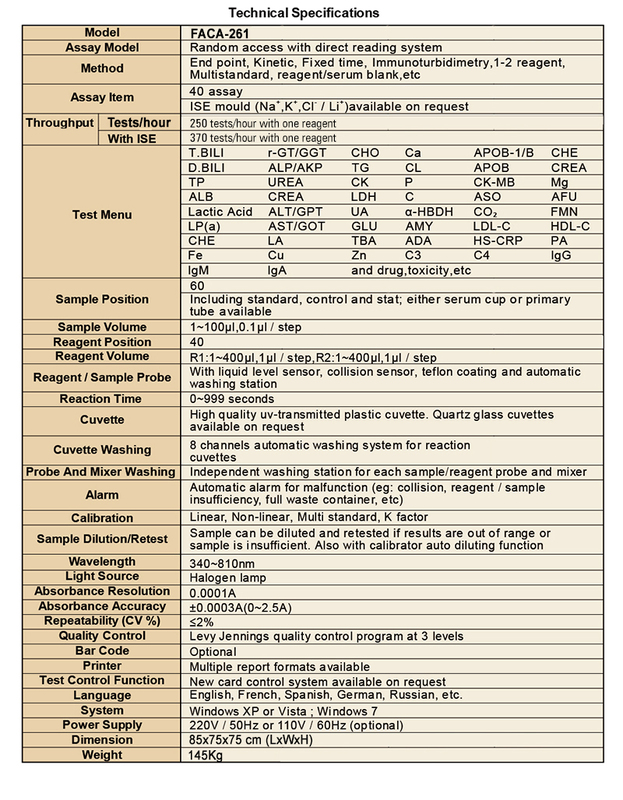 The FACA-261 provides testing for a wide range of reagents. Please contact us for a complete list. Labomed, Inc. Mailing Address: 2728 S La Cienega Blvd.